Though we do our best to filter out users that are just out there to scam others, we understand that there are still other users who may abuse the messaging system. We have added a block feature that allows a user to block someone else who keeps messaging them, and not matter what they do, will not leave them alone. To block a user, first go to your conversations by clicking on the conversation bubbles towards the top right. Select the conversation with the user that you want to block. Click on the gear icon at the top right of the conversation to open the option menu. 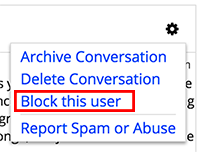 Click on the "Block this user" menu option. This will delete the conversation, and prevent any future communication from this user. 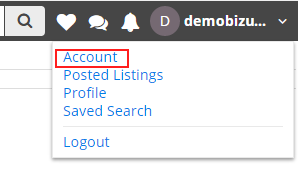 To view users you have blocked, click on your username in the top right of the page to open your account menu. Then click ok the "Account" menu option. 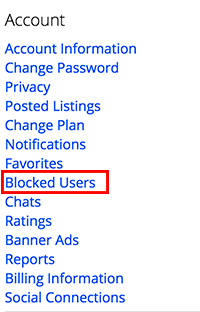 In the navigation menu on the left side, click on "Blocked Users." Here you will see a table of all the users that you have blocked. It will show you the username of the person and the date/time that you blocked them. If you wish to unblock the user, simply click on Unblock User.